On July 13th The New Republic ran an extensive and detailed article of nearly 6,000 words by noted investigative journalist Craig Unger on President Trump's extensive historic business dealings with Russian organized crime figures. As an editor, I have no reason to doubt Craig Unger's facts. He has fact checked my work in the past and confirmed it without reservation in Salon. The current editor and relatively new editor of The New Republic, Eric Bates, is an alumni and trustee of Antioch College, my alma mata. He gave a presentation there this past weekend at my 20th college reunion, which occoured between the publication of Unger's article and the article you are reading now. This editorial disclosure is a rather uncomfortable one to make before launching into criticism of 6,000 words worth of Mr. Unger's work, but it must be done to preserve the integrity of the editorial argument I intend to make. Unger's recounting of Trump's business ties to the former Soviet Union and it's satellites spans three decades and only excludes one incident that I have found documentation to support. That incident would instantly change the entire narrative of the article. That narrative is currently part of the general Russia-centric set of hyperbolic objections to Trumpism from the center-right. It would seem that these objections are focused on attacking the personality of Trump through his foreign connections rather than the content of his character and the substance of his policies. In 1979, the Trump tower, aka Whitehouse North, had yet to be built. The building standing on that site was being demolished by underpaid illegal Polish immigrants who slept on the job site. Labor problems developed when they did not receive their already low wages for working 12 hour days with only sledgehammers and without hard hats. Their strike was broken by the Union that should have been representing them, which was then under the firm control of the Gambino crime family. The President of the United States used unpaid labor illegally imported from a then communist country to build the building we now pay him extra to live with his family in. He then kept the less than $50 a day these men were paid from them using an organization that would be headed by John Gotti a few years later. In the same time frame that Soviet and later Russian organized crime figures were buying into Trump's empire of luxury condos, those condos were being built with concrete poured by companies owned by the Gambino and Genovese crime families. These storied institutions of American organized crime also controlled the labor unions that did that work. 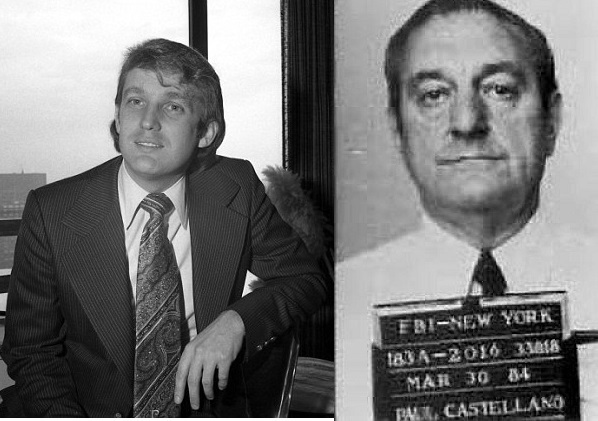 I find it hard to believe that the longstanding ties between two of the five major New York crime families and the President of the United States would not find their way into 6,000 words of reporting on the latter's ties to organized crime. The ties have been documented extensively in a book by Pulitzer prize winning journalist David Cay Johnston. The book is a recently published bestseller. Publications of the caliber of the New Republic and journalists with the detail orientation of Craig Unger have no excuse for not finding it. The parallels and entertainment value of linking The Apprentice with Growing Up Gotti should be too much for anyone to pass up if they are in the business of selling column inches. This important backstory of the Trump's history of criminality did not make the story for some reason and that reason was editorial design rather than editorial error. That editorial design is that it does not fit the Russia-centric narrative of the day. This does the American public a grave diservice in a time of need. The current narrative of “Russian Election Hacking” has little to no substance to back it up. This narrative sits at the center of the discourse amongst centrist liberal intelligentsia as an excuse to avoid critical self examination in the face of electoral defeat. This critical self-examination runs deeper than the weakness of the political class that upholds the center-right segment of the Democratic Party and their Republican moderate fellow travelers. It is old fashioned immigrant bashing. Organized crime is as American as tomato pie and it is always easy to place the blame for it's existence on a foreign other with an accent rather than a part of the American tapestry with a regional dialect. Unger is quick and correct to link recent and current Trump connections to organized crime to the historic KGB and by extension current FSB. Organized crime can not exist on the scale that it does without a dysfunctional relationship with it's host nation's intelligence services. While Putin's oligarch ties to the KGB and Russian intelligence ties to organized crime are amplified, American organized crimes to American intelligence are ignored in Unger's article. HBO can have the highly rated semi-historical drama Boardwalk Empire, yet a New York magazine can somehow ignore a current Atlantic City casino owner's ties to crime families in New York as though all of that was long ago and far away, as though the crime institutions founded in prohibition ceased to exist or never became entrenched despite the more than half century between Lucky Lucciano founding the Genovese crime family and that same family pouring the cement for the Trump Tower. As slogans cross the country and battle lines sharpen, and the center demands respect for existing institutions, the country needs an unblurred mirror for self-examination and the New Republic appears to be out of Windex. The sin of their recent article is the sin of omission, and with that omission goes nuance, history, context and finally truth.